The JLL S400 Motorised Treadmill is a superior piece of equipment boasting a running area size of 135cm x 45cm great for all ambitious runners. 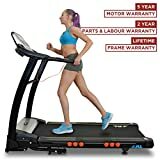 This motorised treadmill is a step ahead of its rivals with a 5.5″ LCD display with adjustable brightness, Bluetooth wireless technology, 15 programmes and 20 level incline. The S400 is a really remarkable machine and a great investment for your health and fitness. Plug your iPod, iPhone or MP3 into USB interface, or use the Bluetooth® wireless technology to stay motivated with your favourite music. Get rid of your earphones for incredible sound from the high powered speakers.